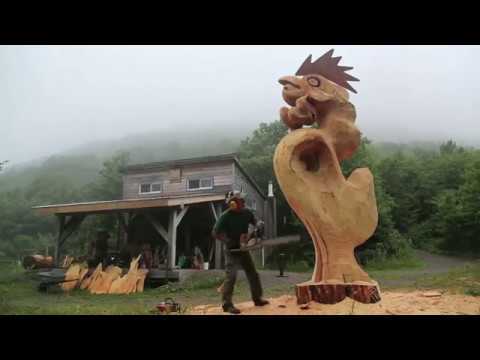 Daniel Haché, a Townships-based sculptor with acadien roots, has spent the last 25 years sculpting trees into monumental sculptures. Guided by the living material he carves, his wood carvings are organic in shape. His artistic inspiration, visualisation, and production overlap in his creative process. Mastering carving tools such as the chainsaw, allows him to be spontaneous and make large or small changes to the carving fluidly. Influenced by work ranging from traditional aboriginal carving to contemporary sculpture, Hache infuses his materials with new life to create artworks that are figurative or abstract. The way light and shade play on the fluide curves and voids of his sculptures are part of his artistic signature. His carving skills are also used to create musical instruments, for himself and for others, such as the Cajun-inspired washboard.